Columbia College—Redstone Arsenal has been educating students since 1975 and recently celebrated its 35th anniversary with a celebration Oct. 19 at Redstone Lanes, 3424 Hercules Road, Redstone Arsenal. Mary Morgan, director of Columbia College–Redstone Arsenal provided remarks at the celebration. "The Redstone Arsenal campus has been exemplary at delivering the education working adults, military personnel and traditional-age students of their community require," said Dr. Gerald Brouder, Columbia College president. "I am very proud of the campus’s longevity and accomplishments and look forward to another 35 years of educational excellence." Columbia College was invited to teach classes to reservists in a Birmingham, Ala., armory in January 1975. Later that year, Columbia College moved to Redstone Arsenal. Columbia College—Redstone Arsenal has graduated more than 600 soldiers, their dependents and civilians since 2002. “The relationship between the military and the college has been a win-win situation for 35 years. Our focus has always been to offer quality education to working adults, and we are most appreciative to Redstone Arsenal for inviting us to serve the needs of their personnel,” Morgan said. The campus offers associate and bachelor’s degrees in business administration and criminal justice, among many others. Redstone Arsenal also offers a Master of Business Administration. Students at Columbia College–Redstone Arsenal are also able to take online classes offered by the college’s Online Campus. More than 800 online classes and 20 online degrees are available including master's degrees in business, teaching and criminal justice. Columbia College—Redstone Arsenal faculty members pose with Mary Morgan, campus director, at the campus’s 35th anniversary celebration Tuesday, Oct. 19, at Redstone Lanes. 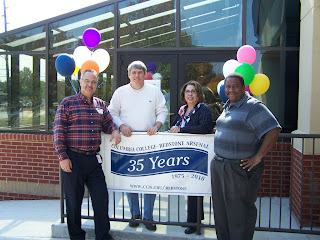 Pictured from left to right are Jeff Purcell, Wesley Savage, Morgan and Ray Nabors. Columbia College—Redstone Arsenal has graduated more than 600 soldiers, their dependents and civilians since 2002. 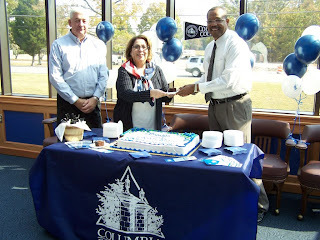 Mary Morgan, Columbia College—Redstone Arsenal Director, hands a piece of cake to Lavelle Smalley, a faculty member since the beginning of the college’s Redstone Arsenal Campus, as ESO Charles Williams looks on. 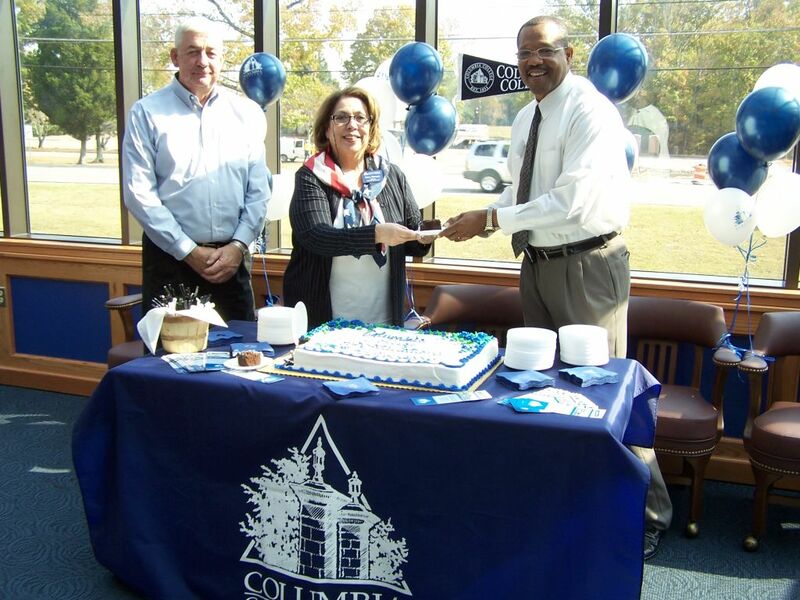 A celebration took place Tuesday, Oct. 19, at Redstone Lanes to honor Columbia College—Redstone Arsenal’s 35th anniversary. Columbia College—Redstone Arsenal has graduated more than 600 soldiers, their dependents and civilians since 2002. This is Janeen and I am about to retire. Please drop me an email for I am applying for a job with Columbia College. You look fabulous as always. twohugedimples at hotmail.